Both the thrill of victory and the agony of defeat were felt by area athletes this fall. St. Joseph’s Academy won a pair of team titles, and five other schools in the Town&Style coverage area celebrated state championships. Three other schools had individual state champions. But there also was heartbreak. John Burroughs, the defending Class 1 state champions in tennis, lost in the finals 5-4 to Pembroke Hill. The St. Louis University High swimming team was edged out by Rock Bridge by just six points. And Vianney, the defending Class 5 football state champions, lost in the playoffs to Pattonville in the game’s final minute. But the emphasis here is on the winners, and there were plenty of those this fall. 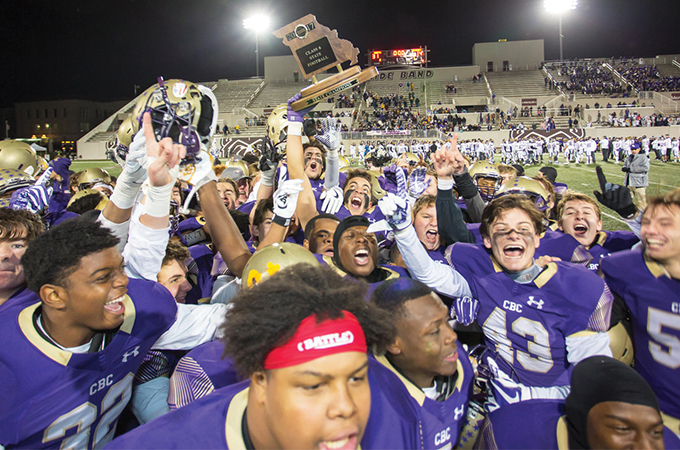 CBC won its second state championship, capturing the Class 6 (largest school class) title. The Cadets defeated Blue Springs 31-14. Bryan Bradford rushed for 123 yards and three touchdowns, and the win also avenged a Cadet loss to Blue Springs in the semifinals last year. The Cadets were 13-1 overall, with the only loss against CBC of Memphis in the second game of the season. The Cadets had a solid defense, but they also were very balanced offensively. Bradford rushed for more than 1,500 yards and scored 30 touchdowns, while Brett Gabbert completed 70 percent of his passes for 2,862 yards. He threw for 33 touchdowns and was intercepted just five times. Ladue was the other area team to make it to the championship. The Rams lost to perennial power Webb City in the Class 5 title game, which snapped an 11-game winning streak. The team had an explosive offense; quarterback Jordan Jackson threw for 1,753 yards and 20 touchdowns. Dale Chesson caught 44 passes for 892 yards and scored 15 touchdowns, and Andrew Hunt averaged almost eight yards per carry, rushing for more than 1,100 yards and 13 touchdowns. It was the second appearance in the championship game for the Rams, who reached the semifinals in 2014 and 2016. Their biggest win this year came in the semifinals against Parkway Central. It was only the second loss of the season for the Colts, who finished 12-2. Both of their losses came against Ladue. St. Joseph’s Academy captured the Class 2 team title. The Angels finished with a two-day score of 623, 10 strokes better than second-place Notre Dame de Sion. Area teams MICDS and Lafayette finished third and fourth respectively in Class 2. St. Joe’s had a pair of golfers finish in the top 10. Grace Aromando was seventh and Grace Renfer was eighth. Lafayette’s Brooke Biermann had the best individual finish for area golfers at fourth, and Shannon Gould of MICDS was fifth. John Burroughs was third in the Class 1 meet at the Columbia Country Club. Cape Notre Dame ran away with the Class 1 title with a score of 319. Ashton Sinak of Visitation had the top local performance, finishing fourth. Lucy Bloomstran of John Burroughs was the other top 10 area finisher at 10th. Marquette made some history this fall, capturing its first-ever state softball title. The Mustangs defeated Blue Springs South 2-0 in the championship game, led by the standout pitching of junior Annah Junge. In the championship game, Junge gave up just one hit in a seven-inning complete game effort. 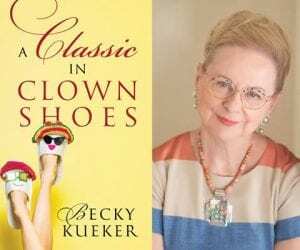 She struck out eight and walked just two. Junge finished the season with a 19-2 record and 1.17 ERA. She had a stellar strikeout to walk ratio, striking out 224 while walking just 35 in 137.3 innings. Offensive support came from seniors Lillie Knesel and Kelsey Lenox, who each hit over .500, while junior Ellen McGinnis provided the power with seven home runs and 55 RBI. Marquette, which won its first 18 games, finished the season with a 29-3 record. Its three losses came by a combined four runs. There were no area team state champions in the state meet, but three of the eight teams in the final four were from the West County area. John Burroughs lost in the Class 1 finals to Pembroke Hill, 5-4. MICDS finished third in Class 1. Lafayette had its best finish in school history at second place to powerhouse Rock Bridge in Class 2. Burroughs followed up the tough loss in the team finals by dominating the individual phase of the tournament. Sophomore Sami Remis, who lost in the finals last year to teammate Gaby Thornton, won the Class 1 singles championship. A pair of Bomber freshmen, Lily Walther and Ainsley Heidbreder, captured the Class 1 doubles championship. The Class 1 singles final was an all-area match as Remis defeated Caleigh McClain of MICDS. Rockwood Summit’s Ella Kinder was the top area finisher in Class 2. She finished third in singles, while Lafayette’s Erin Davis was fifth. 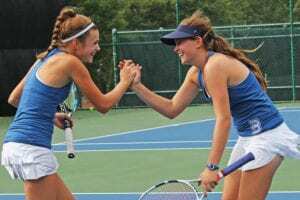 Parkway South’s Megan Moore and Emily Xu were fourth in Class 2 doubles. St. Joe’s had a pair of doubles medalists: Lexi Woodman and Morgan Kane were fifth, and Abby Thurmer and Shannon Sims were seventh. Villa Duchesne defeated MICDS 2-1 in the championship game of the Midwest Field Hockey Tournament Championship. It was the 10th overall championship for the Saints, but their first since 2007. Villa and MICDS played scoreless ball for the 60 minutes of regulation and 20 minutes of sudden death. Saints goaltender Emma Deines stopped four of five shots in the 1 vs. 1 shootout, and she was the standout in the final four as she shut out Nerinx Hall 1-0 in the semifinals. Villa finished the season with a 27-2 record, winning its last 19 matches. Area teams won two of the four state championships this fall. Priory captured the Class 2 state championship 3-0 over Lincoln College Prep. It was the third state title for Priory, which also won championships in 2005 and 2011. Will Kelly had 15 goals to lead the team, which finished second to John Burroughs in the Metro League. John Burroughs finished the season with a stellar 18-3 record, but lost to Priory in the post-season. 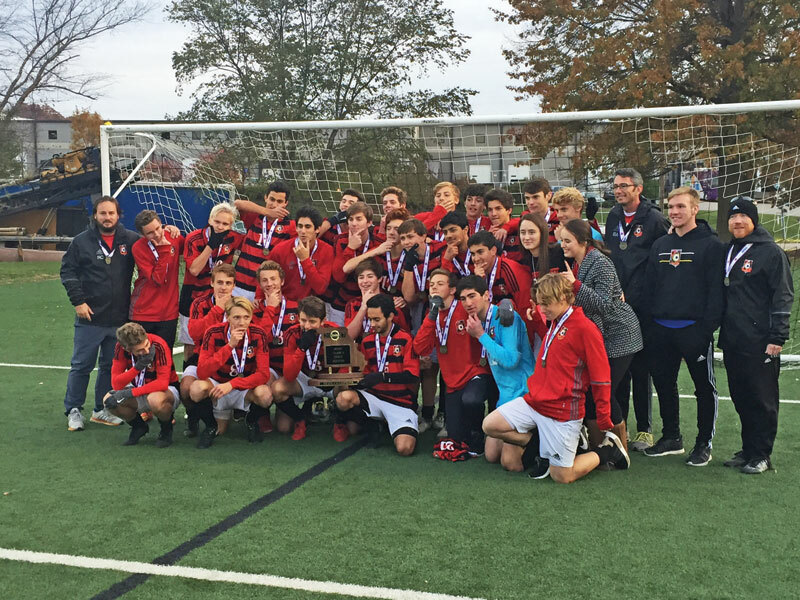 Parkway Central won its first state championship, capturing the Class 3 title at Soccer Park. The Colts had not been to the final four since 1986, when they finished second. They lost their first three games but saved the best for last, winning their final six games while giving up only two goals. Parkway Central did not allow a goal in its two games in the final four, defeating Republic 3-0 in the semifinals and Washington 1-0 in the championship game. Matthew Deay scored the only goal in the finals from a corner kick by Adam Burnett. Burnett had 20 goals to lead the Colts, who tied Clayton for the Suburban Central- National Conference title with 4-1 records (Parkway Central defeated Clayton 1-0 in its league contest). 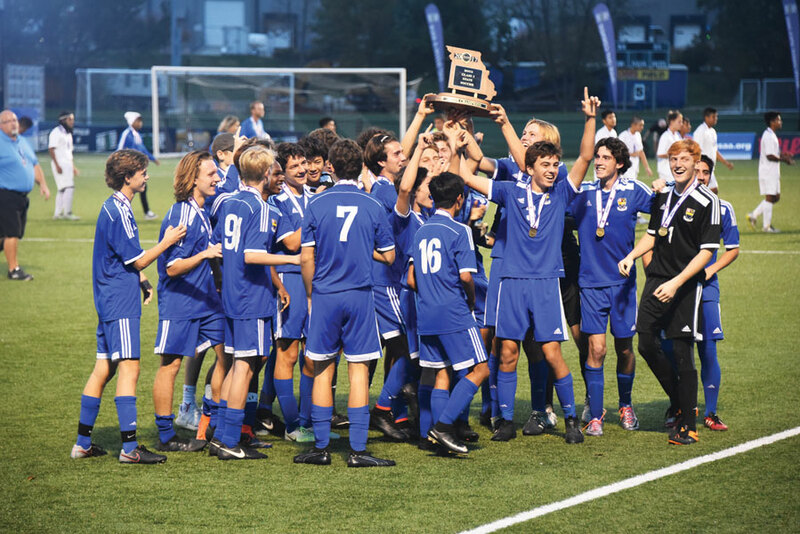 Vianney did not win a game in the rugged Metro Catholic Conference, but the Griffins were one match away from being the third area team to win a state title. 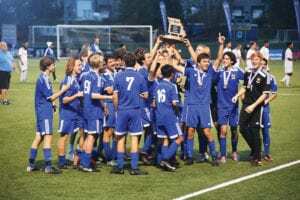 They fell to Rockhurst 3-2 in the Class 4 championship game. Vianney, which beat Kickapoo 3-1 in the semifinals, finished the season with a 23-8-2 record. CBC won the Metro Catholic Conference regular season title and finished third in Class 4. The Cadets lost to Rockhurst 2-1 in the semifinals and came back to crush Kickapoo 6-0 for third place. CBC finished 22-6-2 overall. A third MCC team, St. Louis University High, also had a great season, finishing 21-4-2. The had a 4-1 win over Trenton in the semifinals but lost in the championship game against powerhouse Strafford, 83-37. Sophomore Alijah Blackwell averaged more than 20 points a game for Whitfield. St. Joseph’s Academy won the Class 4 championship. The big win on the road to state for the Angels came against Lafayette, 25-21, 25-17. The Lancers had won the previous six Class 4 state titles. But the Angels did not let up at state. They went 6-0 in pool play with wins over Ozark, St. Dominic and St. Teresa’s. They defeated Ozark 25-20, 25-13 in the title match. St. Joe’s finished 31-3 during the season. 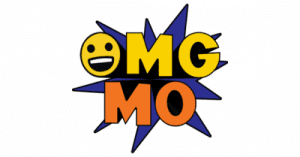 Its lone loss against an area team came against Lafayette. Seniors Madison Gresham and Gabby Blossom led the way for the Angels. Gresham led the team with 310 kills, while Blossom had 865 assists. The state championship streak was stopped, but it was another amazing season for Lafayette, finishing 35-3. Lafayette won the Suburban West Conference with a 9-0 record. 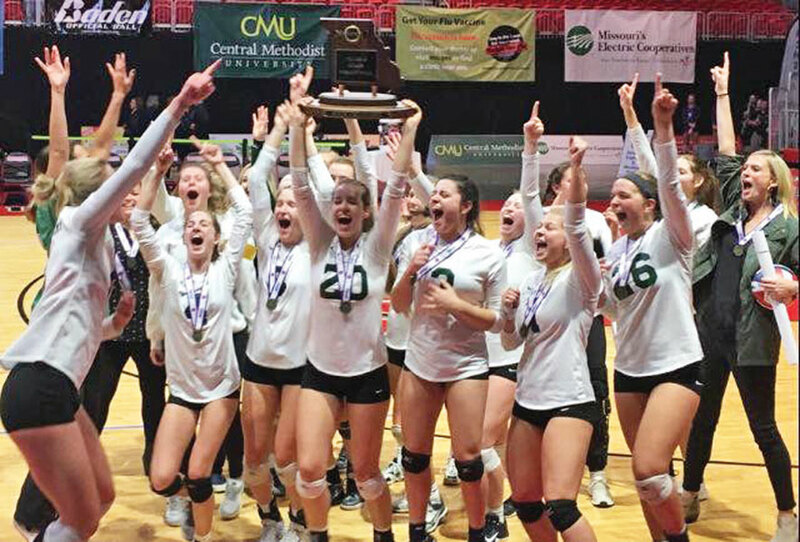 The state championship was divided into two classes for the first time this fall. St. Louis University High almost came home with the inaugural Class 2 team title. The Junior Bills and Rock Bridge were tied with 203 points after 11 events, but Rock Bridge won the 400-yard free relay to finish with 243 points. SLUH, which was second in the relay, finished with 237 points. Kirkwood earned a team trophy for the first time since 1982, finishing fourth in Class 2. Kirkwood’s Jack Wever was the outstanding swimmer in the area this fall. The Louisville University recruit won a pair of events at state: the 200 IM and the 100-yard backstroke. LADUE won a team trophy in Class 1, finishing fourth. There were no area individual swimming champions in Class 1, but Hunter Grannum of MICDS captured the diving championship. The highlight in the state meet was a win by area freshman Kylie Goldfarb of John Burroughs who captured the Class 3 championship. Her teammate Grace Gore was eighth. It was not a great meet overall for area girls. Parkway West was the top team in Class 4, finishing sixth. No area runner finished in the top 20 in Class 4. Westminster Christian Academy was eighth in Class 3, and the boys did not have a team or individual champion. Malik Stewart of Maplewood had the best performance at state. He was second in Class 2. A pair of Lafayette runners finished in the top 10 in Class 4: Nassim Oufattole was sixth, and Harrison Brown was eighth. The Lancers finished fourth as a team. Parkway West did not have a top 10 finish but its depth was good for a third-place team finish in Class 4. Nick Warmann came in ninth, helping Marquette to a sixth-place finish in Class 4.